If you or a loved one has been injured due to an unsafe and dangerous product in Florida, we can help you recover compensation for your injuries. How Can We Help You with Your Product Liability Case? Each year, we see hundreds of cases where individuals are injured or killed by dangerous products. Product liability can range from medications to defective household products. I have been injured due to a faulty ignition switch from General Motors. Mr. Sean M. Cleary represented me and took care of everything. My husband called The Law Offices of Sean M. Cleary and Sean, unlike other lawyers, took the case, and he won! I was severely injured while windsurfing in the Florida Keys a while back after a fishing boat hit me. I required several surgeries to fix my leg and foot, and Mr. Cleary helped me receive compensation for these injuries. I am very grateful for his help and highly recommend his services. He always conducts himself with the utmost integrity and is exceptional in what he does. My wife suffered severe injuries while scuba diving, as the dive master failed to properly guide the group she was with. Mr. Cleary was extremely helpful, assisting me with paperwork, the relevant documents I needed to file for a lawsuit and started the legal procedures right away. He is nevertheless a reliable and a true professional, seek his help if you need an experienced lawyer. We were satisfied by Mr. Cleary's legal services. An extraordinary lawyer! Sean has helped our family receive just compensation after we lost my husband in a terrible plane crash. He was very courteous and always easy to get a hold of when we had questions. I definitely recommend him for those needing a strong legal advocate to deliver winning results. Finding a great lawyer for your case can be quite a challenging journey sometimes, so I can say I was lucky to have found Sean on such a short time. My house was totaled because of a defective fogger and I needed legal help to do something about it. Sean handled my case in no time and fought to obtain a favorable settlement to cover my damages. Very professional, easy to communicate with and overall a great person, thank you. Clients were satisfied by Mr. Cleary's legal services. We were referred to Mr. Cleary by another lawyer we know, who spoke very highly of him. He turned out to be more than right. He is very diligent, extremely well prepared and very friendly. We strongly recommend Sean to anyone needing a lawyer in Miami. Every year in the United States, defective products kill over 22K people and injure 10% of the population. An average of 168K children is treated in the emergency room every year due to defective toy-related injuries. A defective product can carry a design defect that makes it dangerous for consumers or workers. Defective products include car components, children’s toys, furniture, drugs and medical devices, child car seats, power tools, gas and electrical appliances, and much more. Over 400 defective products are recalled each year but before the recall happens these products injure or even cause death to consumers. These cases require a thorough investigation and often the knowledge of numerous experts in highly specialized technical fields of expertise. If you were injured or suspect a product is defective call us 305.416.9805 and we will evaluate the product and check if you have a case. 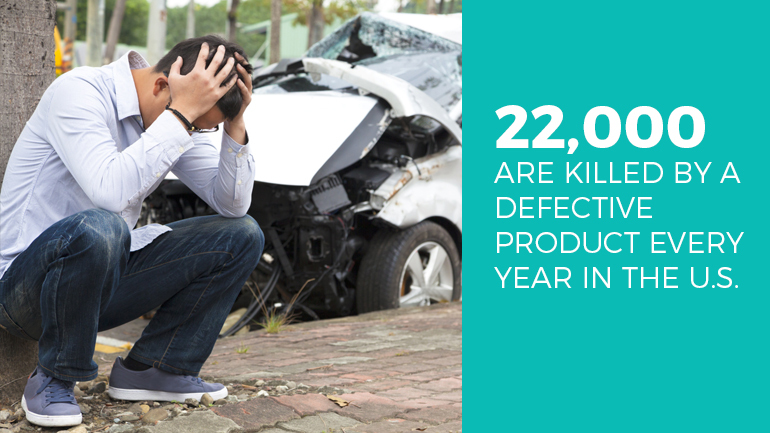 Manufacturing defects can lead to very serious auto accidents. Either the driver of the vehicle or one of the passengers may suffer serious injuries or even death due to defects in the vehicle’s design or failure to function properly of a defective component in the car. In many cases, the car accident or crash may be caused by a negligent driver, but the car's design or components may contribute and lead to injuries or fatalities. Once a recall is issued, stores are required to pull the product from their shelves, but the manufacturers can still be financially liable. A consumer or a user of a product suffers serious injury or death due to defects in the product’s design or failure from mechanical or manufacturing issues. Product injuries may arise from incidents at home, at the workplace, or anywhere else where the product is being used. Airplanes, helicopters, and boats are complex machines, and just one defective part can trigger an accident. Product liability claims are brought when there are defects in the equipment, defects in the design, or other structural problems. Mechanical problems may contribute to a crash and the resulting deaths and injuries. Under the theory of strict liability, manufacturers can be held liable for such mechanical problems. How Do We Handle a Product Liability Case? How can The Law Offices of Sean M. Cleary help you in a product liability case? Many of the accidents and injuries caused each year by defective or unsafe products could have been avoided. It's the duty of manufacturers, distributors, and sellers to produce and sell products that are safe. Many times, manufacturers and sellers disregard these obligations and put profit over our safety. If a product has caused an injury due to design-related factors, like unsafe design, manufacturing defects, or the failure to provide proper instructions and documentation on their label, you can file a product liability lawsuit. You need a trustworthy product liability attorney by your side. At The Law Offices of Sean M. Cleary, we have been handling product liability cases since 2005. We do it by hiring experts, gathering documents, researching and proving your case, we look at the history of your injury caused by a defective product and understand what you are going through. Our team is dedicated to fighting and our results prove it: we have a record of numerous successful product liability cases and we've recovered multi-million dollars for our clients. If you were injured by a product, or you are unsure if you have a case or not, just call us at 305.416.9805 for a free case evaluation and to initiate prompt action if case be. From a product liability lawsuit, you can recover economic damages, which can include medical care, lost wages, loss of earning capacity, loss of services provided for the family, and noneconomic damages, which usually include pain and suffering, mental anguish, physical impairment and loss of enjoyment of life. Punitive damages can also be awarded in certain cases. Yes, you can sue a foreign corporation for a defective product sold in the United States. In order to make your claim, you must prove the following aspects: your loss, the existence of a defect, failure to warn about risks, and that it was the product's defect that caused your injury despite the proper use of the product. In Florida, an action for injury to a person caused by a defective product based on the theories of strict liability, negligence or contract must commence within four years. Failure to file within the time limit leads to the inability of suing. For example, if you are injured on January 1, 2016, you must file a Florida personal injury claim by January 1, 2020. Product liability refers to the idea that a manufacturer or a seller can be held liable for selling a defective product. The responsibility for a defective product, especially when it causes injuries lies with all sellers and distributors of said product. Manufacturers are obliged to provide safe products or to warn the consumer about the potential risks involved in using their product. In case the manufacturer does not provide reasonable care towards the users of the product, they can sue in order to recover financial compensation for their injuries.